"Krampus? I think I've heard of that. What is it?" "Holey moley!!! What kind of weird freaked out deal is this??" 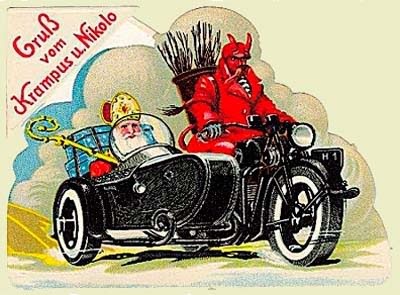 Here in the U.S. of A. we know that if we are good all year, the big guy in the red suit (aka Santa Claus) will visit our homes on Christmas Eve. 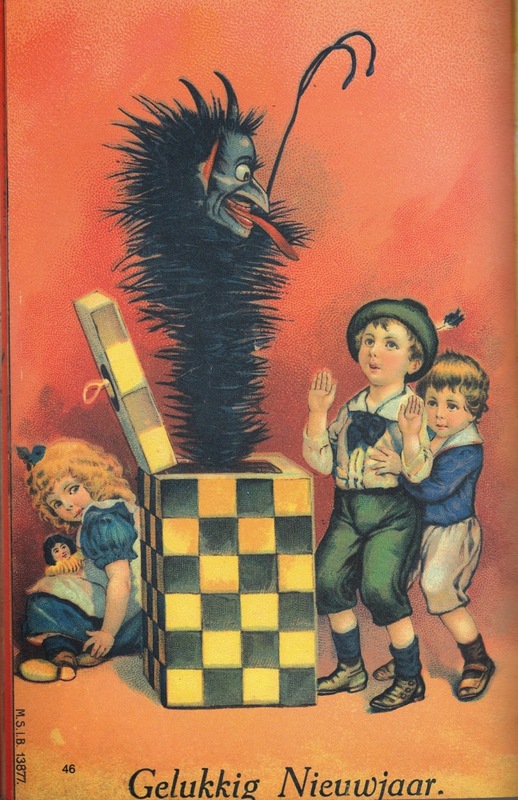 We wake on Christmas morning to find everything we asked for wrapped beautifully and sparkling underneath our brightly decorated tree or placed in the stockings which we had hung by the chimney with care. Well, that’s the story we are fed as children and it’s the story that is perpetuated in seasonally relentless advertising, omnipresent xmas songs and especially in sickly sweet family oriented made for tv movies. But what if we weren’t good all year? 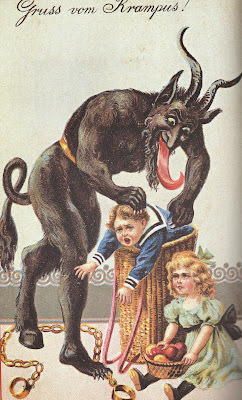 What if we were naughty? What if Santa knows this (and we know he does) what happens then? In that case, the other part of our fairy tale is supposed to kick in which says something about getting a piece of coal in our stockings instead of presents. I for one have never heard of anyone finding any piece of compressed bituminous or carbonized material, not even a charcoal briquette, in a stocking or in any other garment on xmas morning, which kind of makes me question the whole thing. I mean, I believe in justice. 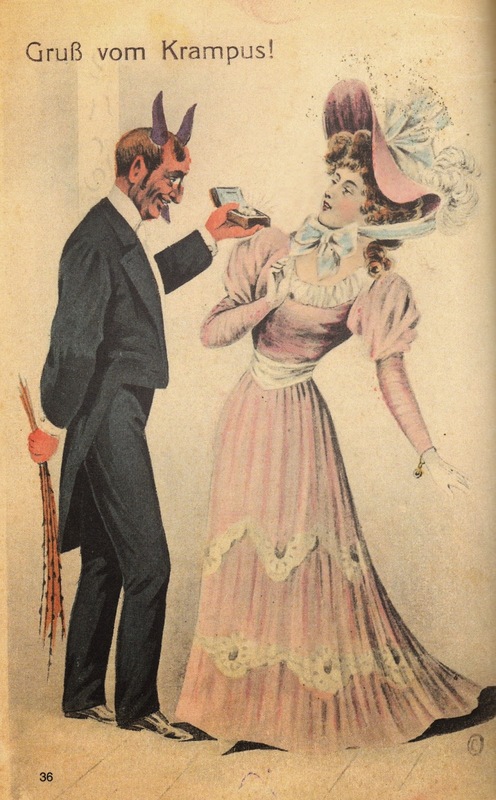 Shouldn’t there be some sort of tangible retribution for those of us who have misbehaved? The nice guys should have a happy ending and the bad guys should be punished. Right? Right??? We must look to The Old World. 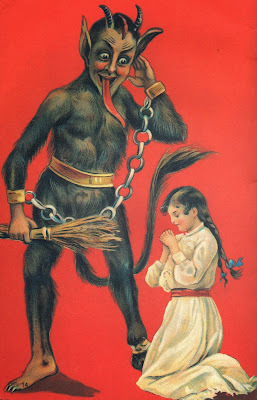 Europeans, bless em’, have just the thing in the form of Krampus. And just who is this Krampus, you ask? 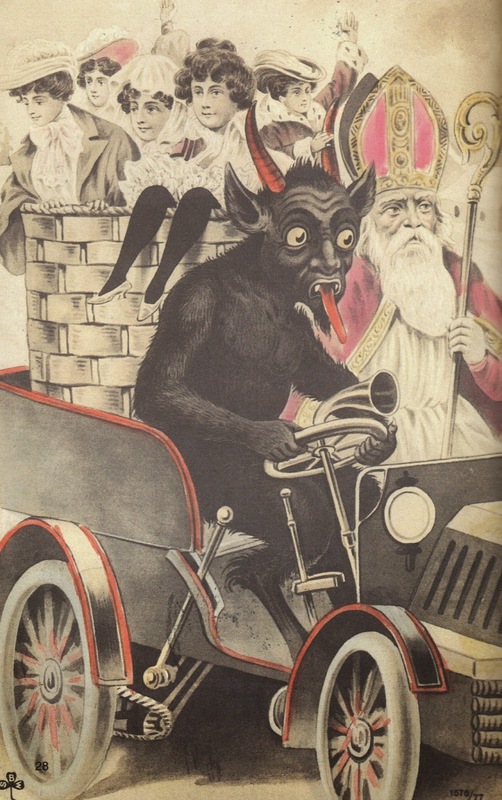 He is a devilish companion/counterpart to Santa, or as he is known there, St. Nicholas. St. Nicholas was originally a third century c.e. Greek Christian bishop known as Nikolaos of Myra who was made a saint on the basis of his charity and several miracles attributed to him. 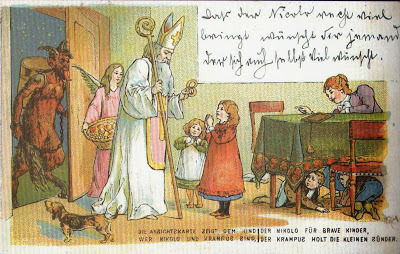 His feast day is December 6 and it has been celebrated traditionally in Europe for centuries with prayer and exchanging gifts. 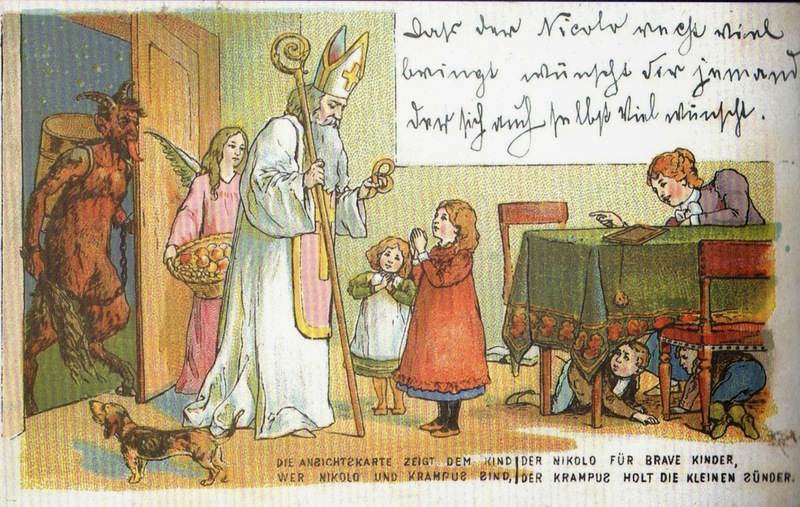 St. Nicholas himself was said to visit homes and reward the good children with fruit, pastries, candy and toys. 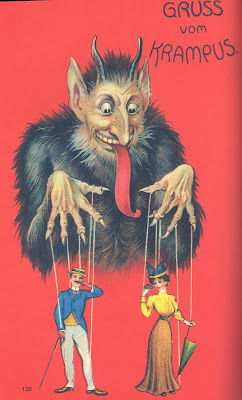 However, since Good and Evil usually come as a package in one way or another, St. Nicholas has an evil twin – Krampus. 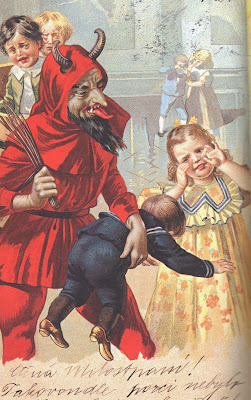 This character doles out punishment to children who have neglected their prayers or disobeyed their parents. 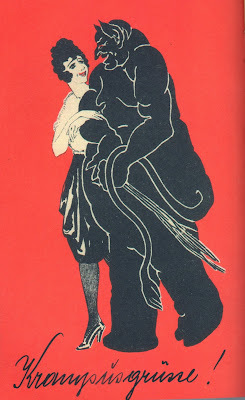 He gathers them up, drags them off and usually gives them a taste of his birch rod on their backsides. If they have really been bad they end up in his cauldron, cooked and eaten up by the Krampus. The origin of Krampus pre-dates that of St. Nicholas and may involve pre-Christian Pagan identities and customs. 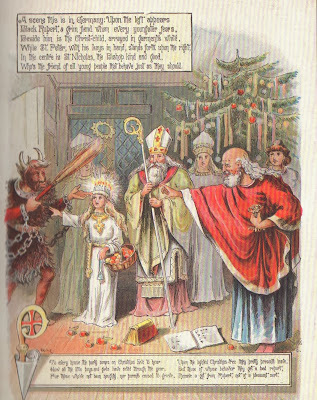 He is probably an example of how Pagan beliefs were merged with the early Christian church much like the holiday itself was merged with pre-Christian winter solstice festivals and Roman Saturnalia. Primarily he has been part of the winter celebrations in the alpine countries of Austria and Germany. 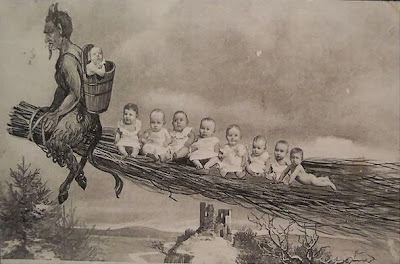 Modern day Krampuslauf, or Krampus parades/running of the Krampus, are held annually in many towns in Austria. Here is a sample of one from Graz, Austria in 2010. 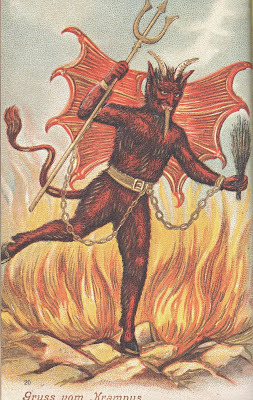 However, he is also found in Northern and Eastern European traditions under a variety of names and presentations. 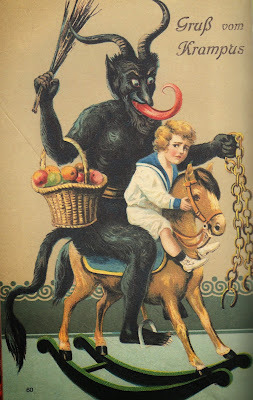 He is known in Austria as Krampusz or Klaubauf, but is also called: Netherlands – Zwarte Piet or Black Peter; Switzerland—Schmutzli; Germany— Knecht Ruprecht or Pelznickel; Czechoslovakia—Certa, and many other names in many other places. Sometimes he has long horns and sometimes short, he can be red like the traditional Devil or covered in black fur. He often has one human foot and one cloven hoof, and usually has a VERY long tongue. Sometimes he carries a chain or a cowbell or a birch switch. He may be shown with either a large sack or a basket in which to cart off the unlucky children. 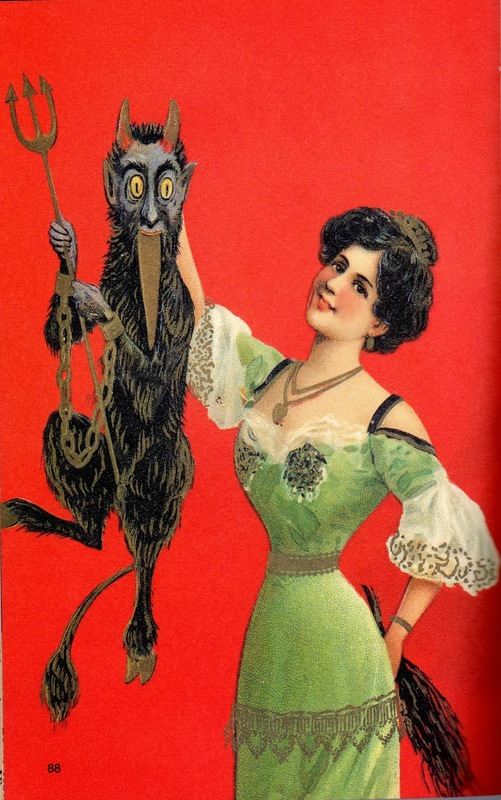 Postcards featuring the Krampus were popular in Europe in the late nineteenth and early twentieth centuries. 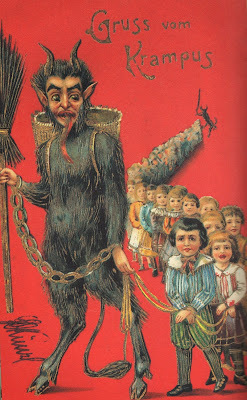 Mostly they reminded children to be good or else and some were pretty explicit about what Krampus would do, however many were much more lighthearted. 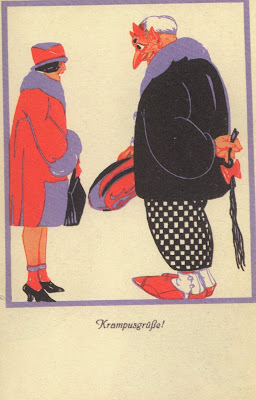 Adults were not left out of the fun entirely; some of the cards had a definite mature or even slighty racy flavor. By the way, “Gruss vom Krampus” is German and means “Greetings from Krampus”. 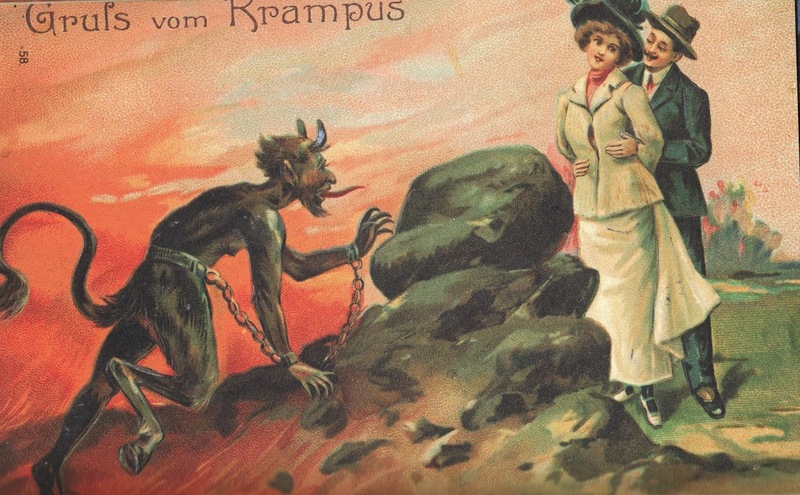 Like everyone, Krampus had to keep up with the times. 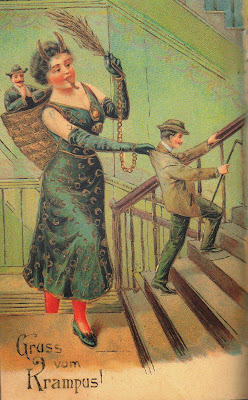 He couldn’t always be on foot or using a sleigh. There is an awareness of Krampus stirring in the US as we speak and more communities are including him in their December festivities. There were at least two small public events in Chicago this year but they were criminally under publicized. 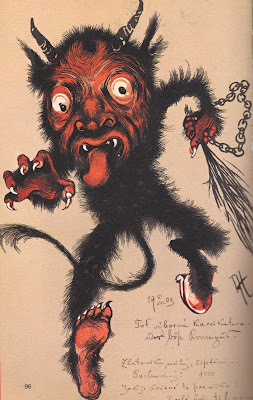 I am planning to advocate during the coming months for more recognition and celebration around the Krampus-meister. How about a parade, fellow Chicagoans? 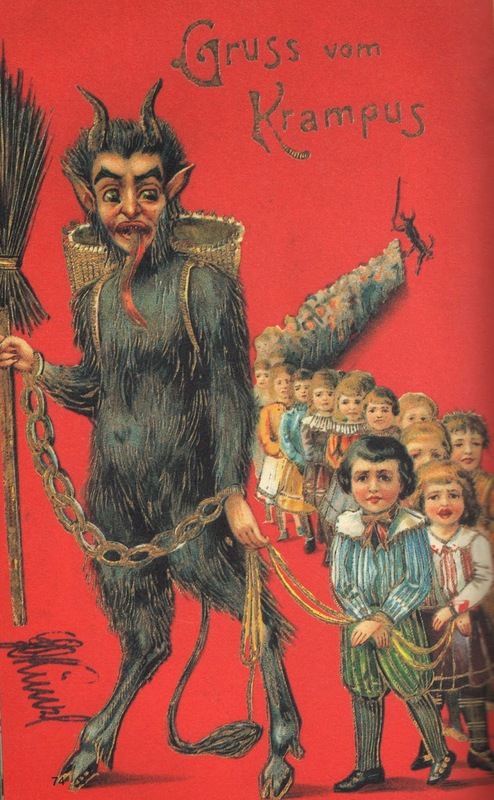 We have a Zombie Parade so why not Krampus? I will start on my costume soon – where in the heck am I going to get a pair of horns? 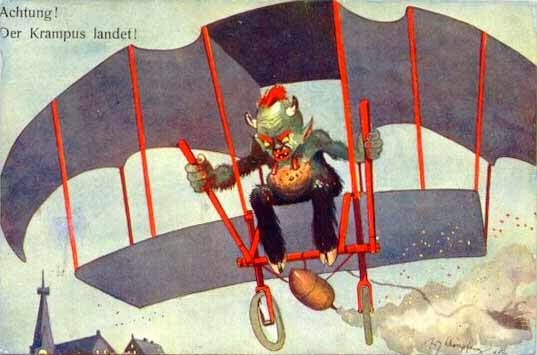 Here is one suggestion for a Krampus Carol. 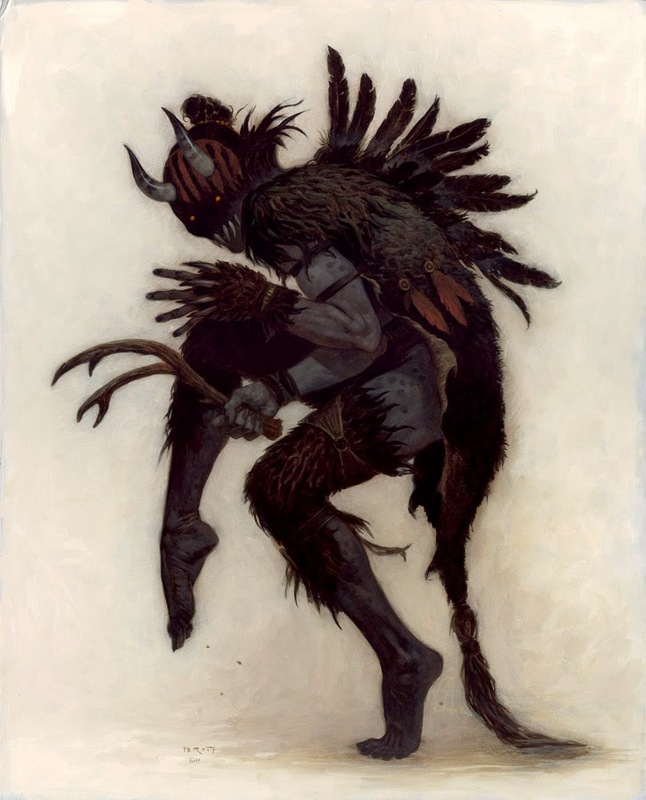 If you are in Chicago during December, 2014 and you see someone dressed in fur and horned mask going house to house singing this, it will probably be me. And, by the way….the devilish side of Christmas has not been ENTIRELY ignored in the Americas. Here is a clip from a 1959 children’s movie made in Mexico entitled “Santa Claus” where the right jolly old elf is presented with a Satan toy which segues into a visit to hell where the red tutu wearing devils are putting on a floor show. It’s not exactly Krampus but ... The only clip of it I have is from the Mystery Science Theater episode, so you will see and hear Mike, Crow and Tom riffing away at the film in their inimitable fashion. 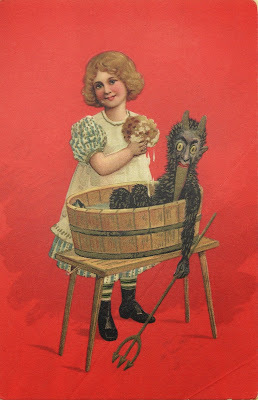 Many thanks, kisses, acknowledgments and a tip ‘o the KissMyReview cap to Monte Beauchamp from whose 2004 book, The Devil in Design: The Krampus Postcards, most of the postcard images were taken. 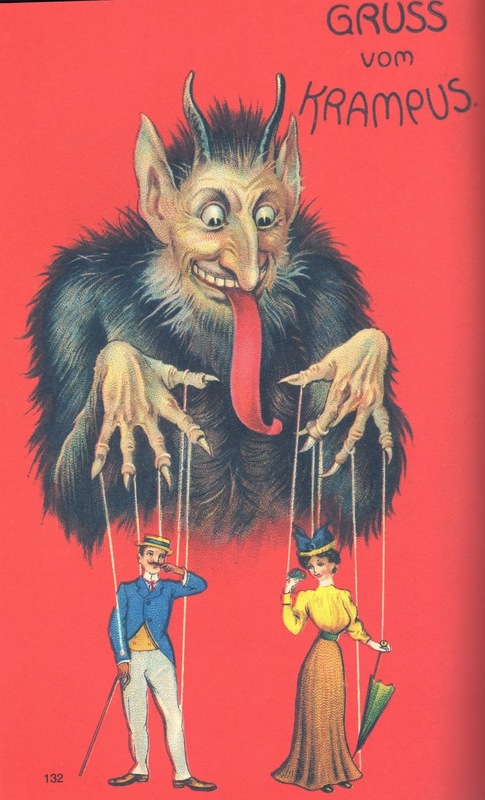 Check out his new book, Krampus: The Devil of Christmas, as well as his other products. 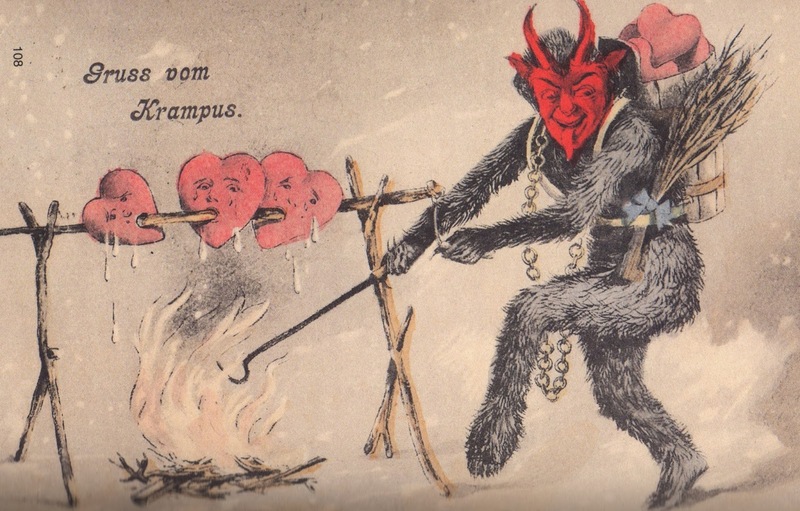 Check out the many websites devoted to Krampus while you're at it. merry Krampus and a happy new year! !